In MANKAR-Drive-P models, metering is carried out via a wheel-driven pump. Therefore, it is dependent on the distance travelled (path-dependent) and not on the driving speed. With every turn of the wheel, a defined volume of herbicide is released. In this manner, the output volume can be precisely metered per unit of surface area (litre per ha). The result: optimal distribution of the active substance over the entire surface being treated. On difficult ground, such as loamy soil, the wheel's thick tread reduces slipping and ensures exact path-dependent metering even under unfavourable conditions. 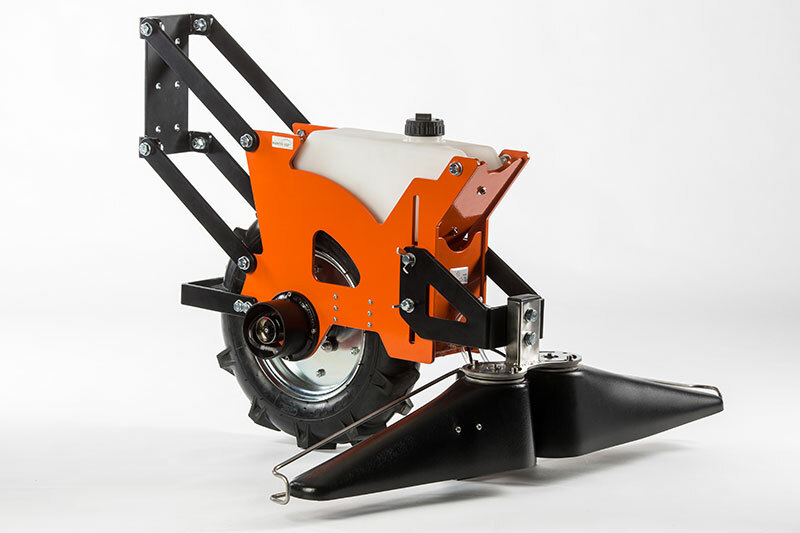 A parallelogram ensures that the wheel is in constant contact with the ground and maintains an even distance between the spray hood and the ground. Optional components are available for mounting the units to special vehicles such as gantry tractors, meaning the units can be used in a wide variety of areas.